There is such a variety of items and the prices can’t be beat. My daughter is growing so quickly that I don’t want to spend a ton of money on things she can only wear for a couple money. JBF is a life saver. 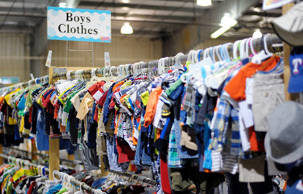 "It's exciting to sell and shop at JBF! So many high quality items to find for my Grandchildren! Volunteering was fun and I got to meet some amazing people. Can't wait for the next one!" "Working with everyone at the sale is fun and satisfying. The staff is very organized and I more every time I participate. best, Gerri Yokers"